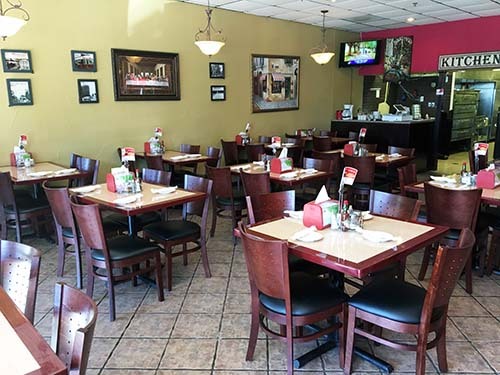 Here at Giovanni’s Italian Café, we’re proud to serve the good people of Lewisville and the surrounding area by providing a personal touch with Italian cuisine. As a family run business, we really believe in making our customers feel like one of the family, too. Great food and great service at a great price- what more could you ask for? Six days a week, our restaurant is here to give you a highly personal experience whenever you drop by. Everything we cook is made from scratch, as we believe only the freshest ingredients are suitable for making the perfect meal. We’re best known for our fettuccine alfredo dishes, complete with fresh baked chicken cooked on a low flame. If you’re new to our restaurant, then we highly recommend that you give it a try! Our head chef and owner has over thirty years’ experience in the restaurant industry. He’s formerly owned a few franchises, but wanted to do something with a more customer-based approach- hence why Giovanni’s was born. Don’t be surprised if you find him bringing your meal straight from the oven to your table, with an apron still covered with flour! We want everyone who steps through our doors to feel like they’re a part of the Giovanni’s family, so we’ll do all we can to ensure that you’re satisfied with your experience here. We want to relate to you, and give you the best meal you’ve ever tasted, so if you like your food cooked in a particular way, just let us know, and we’ll strive to get things just right. It’s the little things that we do which make every meal at Giovanni’s extra special. We stay true to the main principle of Italian cooking- that meals aren’t about finely measured ingredients, but rather about what tastes the best. If we’re cooking your food and feel like it could do with a little spicing up, then we won’t hesitate to go “off the recipe” to ensure that you get a delicious meal from our kitchen. We really do all we can to give you the authentic experience of homemade Italian cooking! Thank you for taking the time out of your day to check out our website. We firmly believe that we’re the best Italian restaurant in the whole of Lewisville and beyond- why not stop by, and let us prove it! We look forward to seeing you soon.